Located 2440m above sea level, San Pedro de Atacama is completely surrounded by dramatic landscapes, barren desert, salt flats, geysers and hot springs. Experience the magic of Atacama over 4 adventurous days starting at the Death & Moon valleys with its incredible stone and sand formations. A short drive will take you to the 3000 year old pre-Colombian village of Tulor where much of the archaeological remains are still visible. 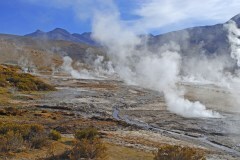 Before the break of dawn, you will leave to the famous El Tatio Geysers to observe powerful spurts of steam shooting our from various geyser blowholes! On arrival you will be met by our representative and transferred to your hotel in San Pedro de Atacama. This colourful village is located 2440m above sea level and in the middle of a green oasis. After checking in, your first visit will be to the Death & Moon valleys, which boasting incredible stone and sand formations. At sunset, you will have the opportunity to view the beautiful fading light over the vast landscapes. 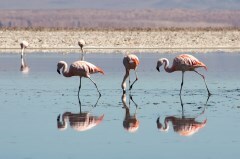 Return to San Pedro de Atacama in the afternoon and enjoy the remainder of your day at leisure. Passengers choosing the deluxe option will enjoy an all-inclusive stay consisting of full board meals, transfers, and a choice of excursions.